On January 21st the Synaxis of Hagia Eirene (Saint Irene) is celebrated. This Hagia Eirene was a church by the sea in the Perama district of Constantinople, along the Golden Horn shore, built by Saint Markianos (Jan. 10), a presbyter and steward of the Great Church in the fifth century, begun during the reign of Empress Pulcheria. It had five porticoes, the roof was covered with lead, and golden mosaics depicted the miracles of Christ. 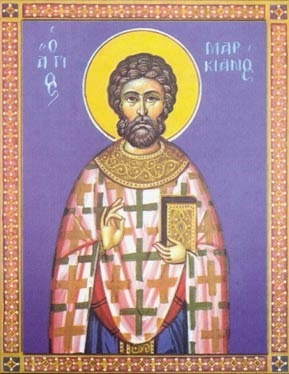 In the Life of Saint Markianos, we are informed that the site of the church and its dimensions were revealed to him in a divine vision. Since Saint Markianos died before its consecration, it was completed by Empress Verina, who finished it and adorned it with magnificence. Parts of the church were later destroyed by fire, but it was restored by Emperor Manuel I Komnenos in the 12th century. This church seems to have been dedicated to the Holy Martyr Irene (May 5), though this is uncertain. It is not to be confused with Hagia Eirene next to Hagia Sophia, Hagia Eirene in Galata, or Hagia Eirene at the Deuteron. In the Life of Saint Markianos, we read of a certain miracle that took place during the construction of this church. When two pillars were about to be set before the altar, a demon sat upon one of the pillars. It was the larger of the two pillars for the north side. This pillar was so heavy that the builders could not lift it. No matter what force was applied to it, the pillar would not move. Seeing this struggle, the Saint prayed, made the sign of the Cross over the immovable pillar, then rebuked the demon, saying: "O enemy and adversary of that which is good, desist and hinder not what is to become to the glory of God." As he said this, the Saint joined the workers in trying to lift the pillar. As soon as he did so, though he was old and weak, the marble pillar moved with ease. When it was put in place, the pillar slightly leaned, and it remained in this position as long as the church stood as a testimony of this miracle.